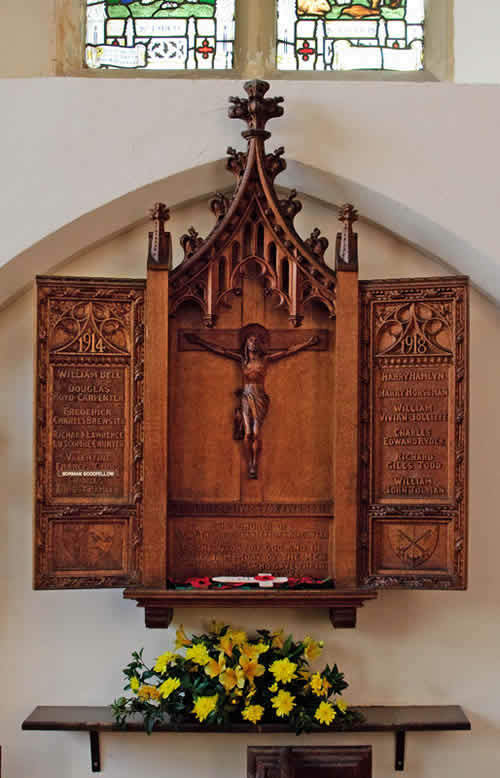 The wooden tryptych commerorating the 1914 - 1918 dead. SP/3130 Private William Bell of the 24th (Sportsmen's) Battalion, the Royal Fusiliers. Son of John and Sarah Bell. Born in Kingswear in 1887 but lived in Dartmouth. Died 13 November 1916 aged 29. Temporary Lieut. Douglas Boyd-Carpenter of the Royal Engineers. Son of William and Annie Boyd-Carpenter; husband of Eileen Boyd-Carpenter. Born in Ripon Palace, Yorkshire 17 September 1887. Died 29 Augusat 1916 aged 28. 2nd Lieut. Richard Lawrence Luscombe of the 7th Battalion, the Gloucestershire Regiment. Son of Richard and Mena Caunter of the The Priory, Kingswear. Born in Axbridge, Somerset in the June Quarter of 1891. Died 19 December 1916 aged 25. Copmmander Valentine Franics Gibbs of the Royal Navy, commander of HMS Iris, formerly of HMS Tiger. Son of Captain and Mrs Gibbs of Villeneuve, Switzerland. Born in Cape Colony, Grahamstown SA i n 1881. Died 23 April 1918 aged 37. 168 Private (Alfred) Norman Goodfellow of the Royal Army Medical Corps. Son of Ann and the late Alfred Goodfellow. Born in Dartmouth in 1897. Died 7 May 1915 aged 18. T2/10361 Driver Charles Ernest Hamlyn of the Royal Army Service Corps. Son of William and Mary Jane Hamlyn; brother of Harry (see below). Born in Starcross in 1887 but lived in Kingswear. Died 19 October 1918 aged 31. 26042 Shoeing/Carriage Smith Henry ("Harry") Hamlyn of the 80th Signals Corps, the Royal Engineers. Son of William and Mary Jane Hamlyn; brother of Charles (see above). Born in Starcross in 1892. Died 19 October 1918 aged 26. 18425 Private Henry Reeve ("Harry*) Horsman of the 8th Battalion, the Devonshire Regiment. Son of Samuel and Mary Ellen Horsman of Woodland Terrace, Kingswear. Born in Plymouth in 1897. Died 20 July 1916 aged 19. 206699 Lance Bombardier William Vivian Jolliffe of the Royal Horse and Royal Field Artillery; formerly 1540 of the Royal Army Medical Corps. Adopted son of Sydney and Jane Style. Born in 1897 in Rosseth, Denbigh, Wales. Died 24 March 1918 aged 21. J/91564 Boy 2nd Class Charles Edward Ryder of the Royal Navy , HMS Impregnable. Son of Charles and Mary Ryder of Reservoir Cottages, Kingswear. Born in Devonport in the March Quarter of 1903. Died 27 October 1918 aged 16. K16099 Stoker 1st Class Richard Charles Giles Todd of the Royal Navy, HMS Indefatigable. Son of Samuel Whitfield Todd of Bowhay, Kingswear. Born in Exeter 11 September 1894. Died 31 May 1916 aged 21 at the Battle of Jutland. 42276 Sapper William John Tolman of the General Base Depot, the Royal Engineers. Son of Richard and Mary Jane Tolman. Born in Stoke Fleming in 1887. Died 23 November 1918 aged 21.